Russell, a volunteer from Philadelphia Academy Charter School, has been volunteering at National Greyhound Adoption Program for a few years now and has a great affinity for our dogs. 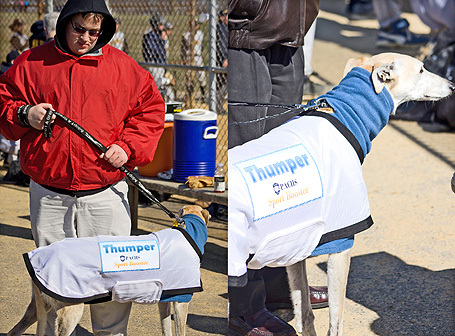 Upon request from PACS, we decided that Thumper, one of our senior greyhounds, could be a mascot for their school! Here are some photos of Thumper busy at work. Thanks Russell and everyone at PACS for your continued interest in and support of our program!